The Sage Hall Computer-Based Testing Center reception area is on the third floor of Sage Hall in Room C330. 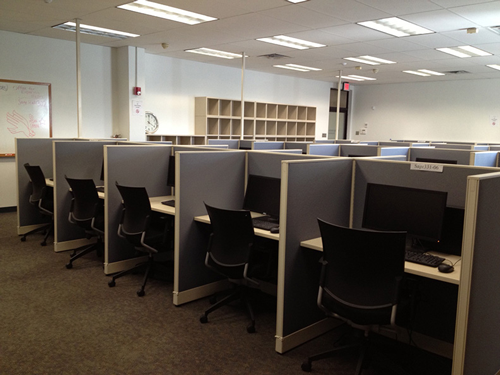 The center has four testing rooms of following sizes. Note: 135 stations are available. Room assignments are determined by the reservation manager. The Windows desktops have the following configuration. For specific software, please ask by sending an email to tc-helpdesk@unt.edu. Machines are optimized for testing with the UNT Canvas learning management systems. Machine configuration for a variety of testing technology scenarios and needs usually can be accommodated with appropriate advanced notice and consultation with our technical manager. If technical requirements are to be made, professors and/or their representing staff should confirm their reservations carefully to include what technologies, applications and features will be needed for each testing session. It is the instructor's responsibility to verify that the computer setup is as they require for their testing event. Instructors are strongly recommended to contact us prior to each event to test the computer configuration. Appointment? Send an email to set an appointment time with our technical manager. Note: The testing center rooms have been optimized for secure testing with security cameras. The facility may not be suitable for other activities, such as training sessions or classes except on a highly specialized basis. Potential users are invited to visit the facility first before requesting the center for non-testing activities. Testing activities always receive the highest priority in scheduling for the center.